Cooking For A Beautiful Woman is a delicious and fully realized food memoir whose portions are always generous. 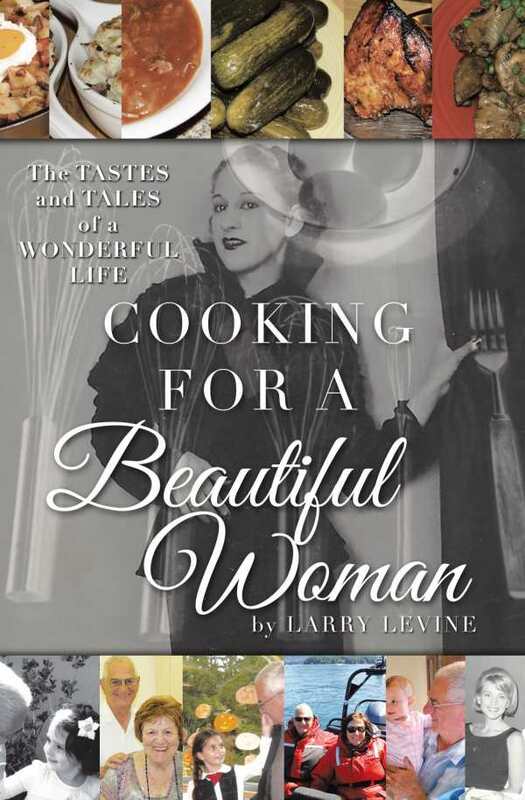 Larry Levine’s memoir Cooking For A Beautiful Woman is a touching collection of stories and recipes culled from a life packed with flavor. It is also an homage to the women who influenced Levine and the dishes he enjoyed with them. Levine estimates that he’s cooked at least 30,000 meals; he’s written hundreds of food features. He’s the editor and founder of Table Talk at Larry’s, an online food magazine. His devotion to good food is apparent in Cooking For A Beautiful Woman, where it is supplemented by his love of women, recalled in wonderful accounts of Levine’s relationships, leading up to that with his wife of fifty years, Jennifer. Levine’s sense of adventure and curiosity drives the book, as does its infectious enthusiasm for stories and snacks. A recurring theme of music and show business adds sparkle. The book’s chapters are arranged chronologically, introducing the ladies in Levine’s life and indicating the ways they influenced his palate. Although Levine identifies himself as a scratch cook whose mantra is “to taste,” his recipes are written with exacting measurements. Each one comes with a story, memory, or recollection that sweetens the meal. Recipes include old-country Romanian dishes handed down from Levine’s grandmother; recipes for Mexican, Chinese, Japanese, Basque, and Greek dishes, enjoyed with different dining partners; Jewish home cooking; New York soda fountain and pushcart recipes from Levine’s childhood in the 1940s; and a few dishes from one of Los Angeles’s most revered Sunset Strip restaurants. The text includes many gems, such as an original, handwritten recipe for Levine’s mother’s gefilte fish: “ask man to fillet & save all skins bones & heads ask man for extra carp head.” Levine has a sharp eye for detail and techniques; at one point, he explains how to “jerk” a long-handled spoon to make an authentic Brooklyn soda fountain Black and White or egg cream. Details, like of the paper cups that held the pushcart Charlotte Russe treats he ate after school, bring the recipes to life. Understanding that food is for every occasion, the book captures high-class celebrity eats and everyday, chicken stock meals, too. Cooking For A Beautiful Woman is a delicious and fully realized food memoir that moves from “what we ate” to “what the band was playing,” its portions always generous.